An NYPD sergeant was killed in a shootout with a home invasion suspect in the Bronx, and a second sergeant was wounded, police officials say. 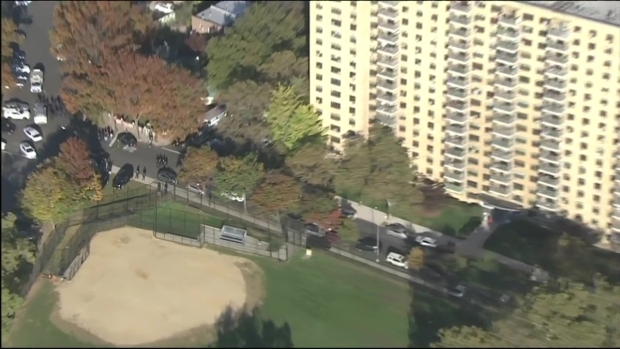 An NYPD officer has died in a shooting in the Bronx, and a second officer is wounded, sources tell NBC 4 New York. The suspect was killed in the shootout with police, sources said. Police sources earlier said that one of the officers was shot in the head and the other was shot in the leg. One official says that at least one of the wounded officers is a sergeant. The officers were taken to Jacobi Hospital. A senior police official says a preliminary investigation shows police first responded to a home invasion along Noble Avenue. Police followed the suspect as he fled the scene, and exchanged gunfire with him a short distance away in front of a storage warehouse, the official said. The suspect died after being shot. Chopper 4 over the scene near Noble Avenue shows a heavy police presence in front of the warehouse, and it appears investigators were focusing on a crashed vehicle on the sidewalkAn NYPD officer has died in a shooting in the Bronx, and a second officer is wounded, sources tell NBC 4 New York. The suspect was also killed in the shootout with police, officials said. "The city is in mourning and the family of the NYPD is in mourning, particularly all the men and the women of the 43rd Precinct, who lost a good man, a man who committed his life to protecting all of us," Mayor Bill de Blasio said at a news briefing Friday evening. The slain sergeant, 41-year-old Paul Tuozzolo, was a 19-year veteran of the NYPD and a father of two young children, de Blasio said. Tuozzolo and the other shot sergeant, 30-year-old Emmanuel Kwo, had been responding to a report of a home invasion at an apartment on Beach Avenue in the Van Nest neighborhood Friday afternoon. That's where an armed man, identified as 35-year-old Manuel Rosales, broke into a home, violating an order of protection filed by his estranged 29-year-old wife, NYPD Commissioner Jimmy O'Neill said at the briefing. Also inside the home was the 3-year-old son of Rosales and his estranged wife, along with another 13-year-old child and a 50-year-old woman. After holding the family hostage for hours, Rosales left the home, and the 50-year-old woman in the house called police and gave police a description of his vehicle, according to officials. Responding police officers spotted the suspect's red Jeep about a half-mile away, in front of a storage warehouse on Bronx River Avenue, O'Neill said. The officers went to grab Rosales from the vehicle and that's when he fired his 45-caliber, semi-automatic handgun, shooting the two uniformed sergeants. Police returned fire, killing Rosales. 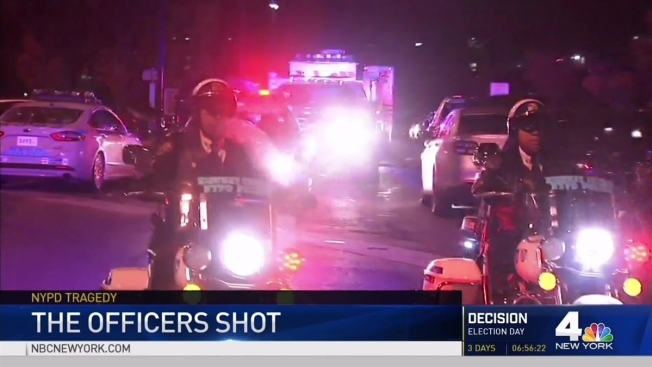 Two police sergeants have been shot in the Van Nest section of the Bronx, the NYPD says. Both the wounded sergeants were taken to Jacobi Hospital, where Tuozzolo, who had been shot in the head, died. Kwo, who was grazed in the leg, is in stable condition. He is a nine-year veteran on the force. O'Neill said Rosales has been arrested 17 times in Suffolk County, where he was believed to be living, and had served time in state prison for possession of stolen property. A court issued an order in January 2015 telling him to stay away from his wife. In July, he was arrested in Bay Shore and was accused of violating that order by grabbing her hair and yanking her head back and forth, records show. He was scheduled to appear in court on Long Island on Nov. 16 on a charge of violating a protective order. A lawyer who previously represented Rosales told the Associated Press he wasn't violent but declined to comment further. Law enforcement sources told NBC 4 Rosales went to the same Bronx apartment Thursday night and a 911 call was placed for a domestic incident there, but Rosales was gone before officers arrived. "I always talk about what a great job this is, but there's nothing worse than a day like today," O'Neill said. De Blasio and O'Neill broke the news of Tuozzolo's death to his wife and his parents and told them the city and the NYPD "would be them for as long as they needed help for years and years to come," de Blasio said. Tuozzolo lived in Huntington, Long Island, with his wife and two young sons. The NYPD sergeants' union said the boys are just 3 and 4 years old. "I don't think there's any words any one of us can say that's going to bring comfort to the family," said SBA president Ed Mullins, who knew Tuozzolo personally. "He was just an unbelievably nice guy," said Mullins. "I'm proud to say he was a great friend and a great cop." De Blasio has ordered all flags on city buildings to fly at half-staff until Tuozzolo is buried. Tuozzolo is the fifth NYPD officer to be fatally shot in the line of duty in the last two years.